Airlock – The uniquely designed gutter around the rim features an air-tight seal making this the safest method of fermentation. Quality – Made from high quality ceramic material with an attractive and practical glaze, the Fermenta crock pot compliments any kitchen with its sleek design while ensuring that your ferments are safe to eat. Capacity – At a capacity of 2 litres the Ferment is a very handy size, producing enough to store in the fridge and start again with another exciting fermentation project. 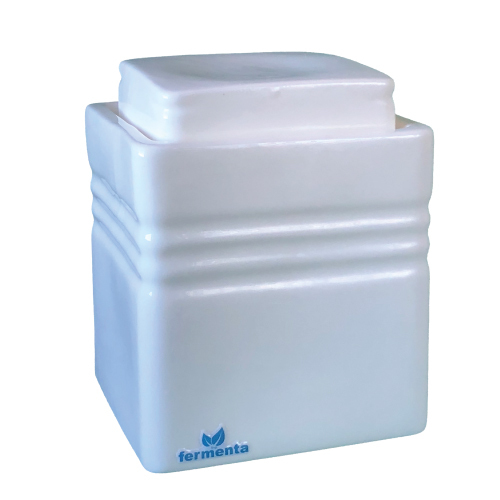 Weights – The Fermenta is supplied with weights to submerge the food under the brine out of contact with oxygen. Hygienic – The Fermenta is glazed ceramic, a non porous material that does not absorb liquid. If you are concerned about your health then consuming fermented foods is a must. Fermenting vegetables is just SOOO easy and inexpensive to do while paying your body huge dividends. Preparing tasty fermented foods has never been easier! To ferment most vegetables you simply need to cut and or shred the vegetables, pack them tightly into the Fermenta fermentation crock pot, add a salt brine, and herbs and/or spices, cover with the supplied weights, put the lid on, pour water or oil into the gutter and you are done! Who eats fermented foods? Who should be eating fermented foods? Fermented foods have long been known by many cultures to be essential for a healthy gut and as a means of preserving food in climates where fresh food is not readily available. Modern science has now proven what Hippocrates said over 2000 years ago “All disease begins in the gut”. One of the best ways of establishing a healthy gut biome is to eat fermented foods regularly. Traditional fermented foods are eaten every day as an accompaniment to meals. Care for your gut biome with fermented foods and you will care for your whole body. Traditional ferments such as the Korean Kimchi or German Sauerkraut are as simple to make as any other mixed vegetables or individual vegetables such as cucumber and carrots, and even mushrooms can be preserved through fermentation. The Fermenta crock pot creates the perfect environment to process perfectly safe, healthy and delicious fermented foods. No starter required! How the Fermenta Crock Pot ensures that the food ferments safely. Lactic-acid fermentation is the method of fermenting food which requires the environment to be anaerobic (oxygen free). Foods can simply be fermented in a glass jar with a lid but since there is not airlock, oxygen can cause the danger of mould growing on the food, and to prevent the bottle exploding, the lid has to be ‘burped’ regularly. The Fermenta crock pot is specially designed with an airlock in the form of a gutter to keep oxygen out and to allow the naturally produced carbon dioxide to escape. 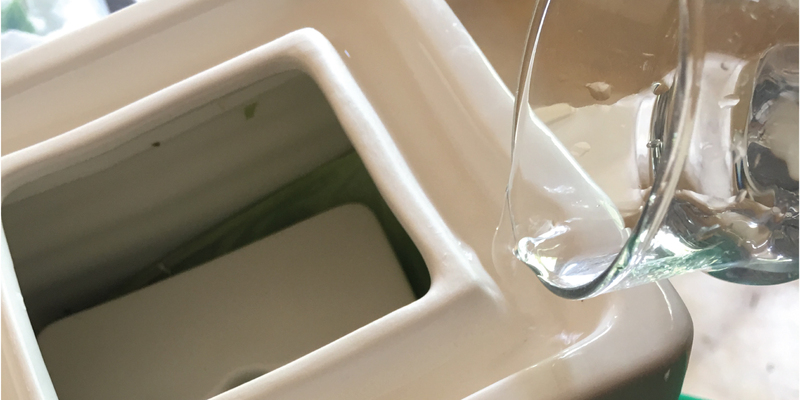 After fitting the lid of your Fermenta, you fill the gutter with either water or oil to create the barrier.